Put Your Heart Into It, is really all about heart. When you attend their workshop, you're made to feel comfortable and welcome, without being pretentious. Laura Issell, the founder of the business was there to welcome us on the night and her short but perfectly timed introduction about what Put Your Heart Into It was all about, was impressive. A Creative Director, Event Planner, Stylist, Business Owner & Facilitator, she's not only created a platform for fellow like-minded artists, change makers and ethical companies to come together and create change, together their aim is to cultivate community involvement and creativity to empower people to make ethical choices by running and planning sustainable events. All images by Writer, unless captioned otherwise. 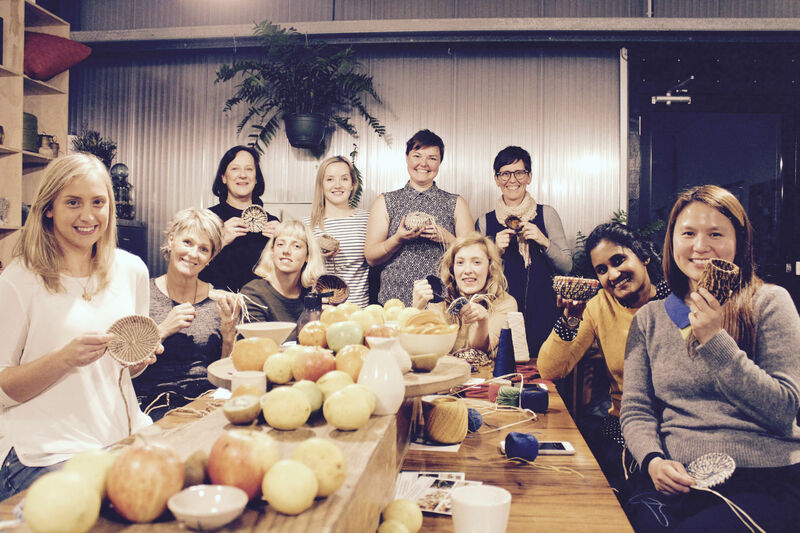 Put Your Heart Into It is a collaborative team that hosts insightful, creative events and workshops in and around Melbourne and country Victoria. Promoting a slower lifestyle they cultivate a nurturing hands-on approach to creativity while creating sustainable and eco-conscious experiences. I think this collaborative team had us all with the impressive, generous share table of local food and wine, which I knew was going to be a challenge to work around. It was definitely a welcome, beautiful distraction that was at times a tussle between grabbing a bite to eat and putting in a new stitch into the coil basket we were weaving and sewing in our hands. It was as Laura said, more of a wonderful night out getting to know fellow participants and having a good time while getting creative and learning a new skill. Our teacher Roz Slade made time for everyone who needed her as she circled the table, helping us make sense of our coil baskets in the making. It would have been far too impersonal and not very eco friendly, but at times I wished there was an overhead projector so we could all see the initial instructive coiling and stitching methods Roz was showing us. However, I have to admit, the personal one on one moments soon had me come around as the coiling and weaving of the basket and the stitches I was putting into it started to make sense as it took shape. More arty than crafty and not having a lot of patience to slow down and work at something intricate, I'm exactly the kind of candidate that needs to be here to learn how to breathe and just enjoy the creative processes. 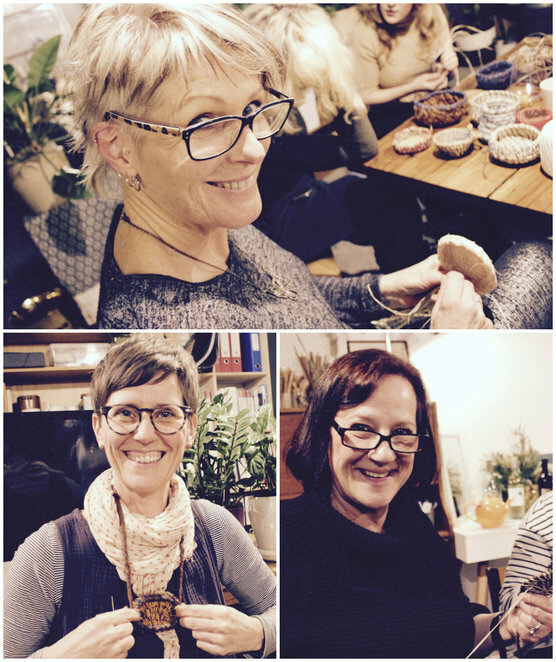 Roz herself has her own small business called Be Kind Textiles and she does natural Shibori Indigo Dyeing, weaving, screen printing and sewing. Having the same ethos as Laura, Roz creates thoughtful quality products using sustainable methods and ethically sourced materials that are kind to the earth. 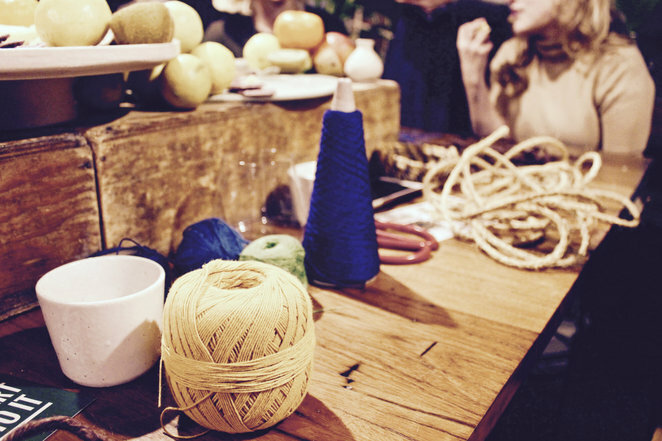 Everything she makes are hand dyed and sewn in Melbourne and she teaches textile based workshops through a variety of organisations and venues. 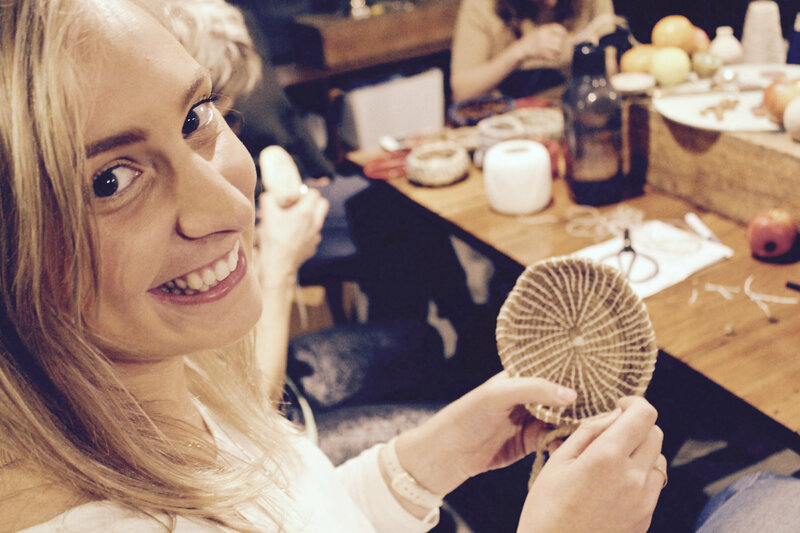 Her knowledge and promotion of the therapeutic act of hand-making something certainly had me charmed and at the end of the night, I was very happy with my little unevenly stitched, natural material coiled basket that has now given me the basic knowledge to create even more (i.e. floor mats, larger baskets etc) awesome items. See if you can pick the star pupil from the images above and below, that had perfect stitches down pat. 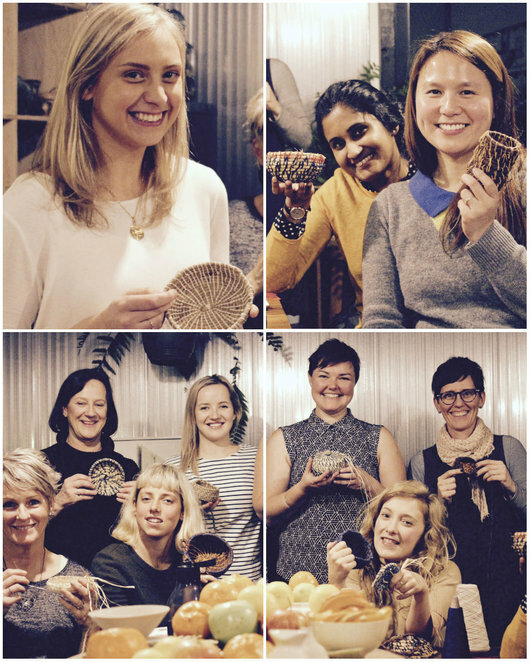 The coil basket weaving workshop was held at Big Bang Studio at 1/177 Beavers Road, Northcote. With a timeframe of 6.30pm to 9.30pm on a week night, like me, you could find yourself caught up in work traffic, so make sure you allow yourself plenty of time. Unfortunately, I had to battle Punt Road and Hoddle Street in peak hour traffic, and it was not a pretty experience that took me an hour and ten minutes to travel to the venue which was a mere 11kms away from Prahran. So now you know. From personal experience, if you're heading out from the Windsor, Prahran, South Yarra area, head out at least an hour and a quarter before time to get there. 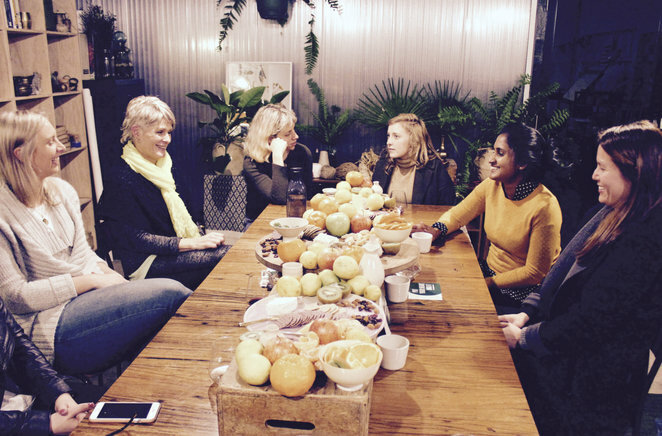 It's no wonder walking into that relaxed atmosphere, the friendly warmth and beautifully arranged food table was a welcome sight for a slightly frazzled me. 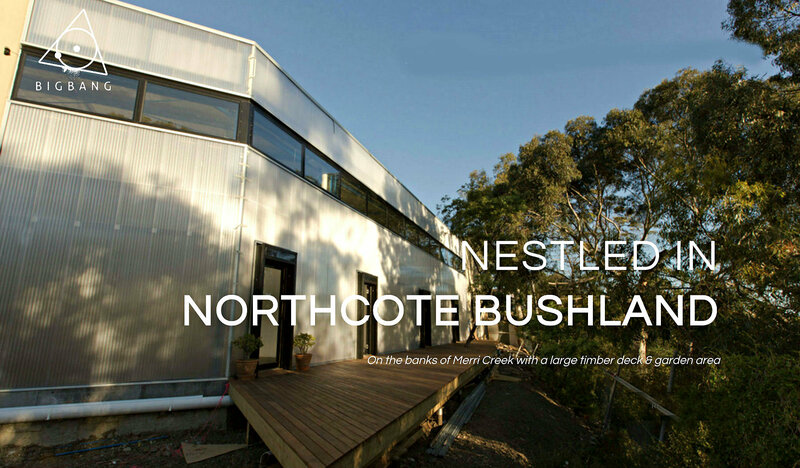 Though it's not easy to see on a winters dark night, the venue is nestled in Northcote bushland. If you're unfamiliar with the area and have not seen it during daylight, it can be a bit scary parking at the end of the cul-de-sac in the dark, especially if you're a bit of a chicken like me. Entry is not via the red door of the building, but just past it, via a timber deck (as per last image). 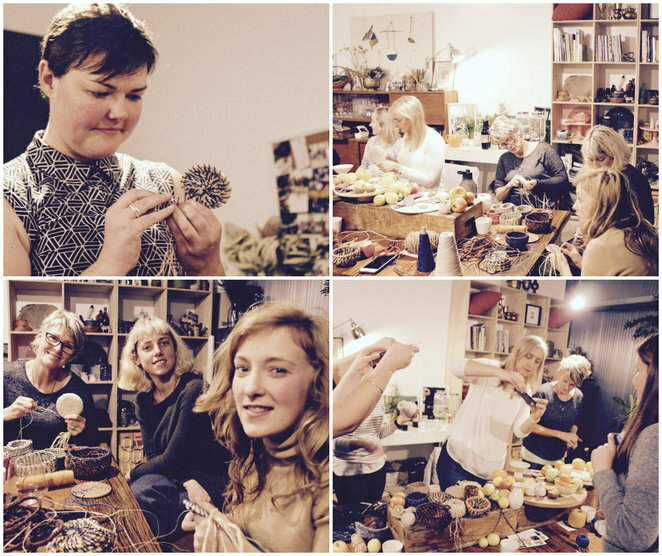 Put Your Heart Into It run a host of other workshops that not only teach you to make something arty and crafty, but they also have classes that teach you food styling, sustainable wedding planning and styling, photography, makeup, fermenting, wild floristry and styling, calligraphy and other empowering classes like mindfulness and embodied love workshops and so much more. The Creative Business Possee event is one where you learn about other businesses in your area and meet the faces behind them. 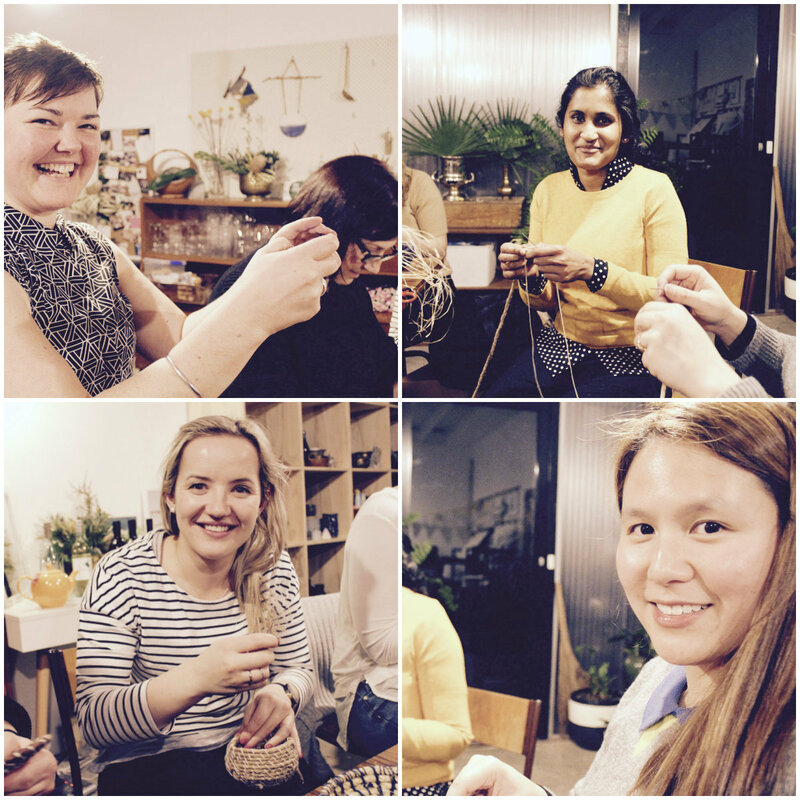 Put Your Heart Into It is truly a melting pot of amazing classes and networking with other ethical organisations. They also cater for special events like a hen's party and organise grazing tables and event planning. You can have a party at theirs or they can come to you. If you want a birthday or any other celebration with a difference, you know who to call. For the same joyful experience I was privy to, be sure to book a class now. 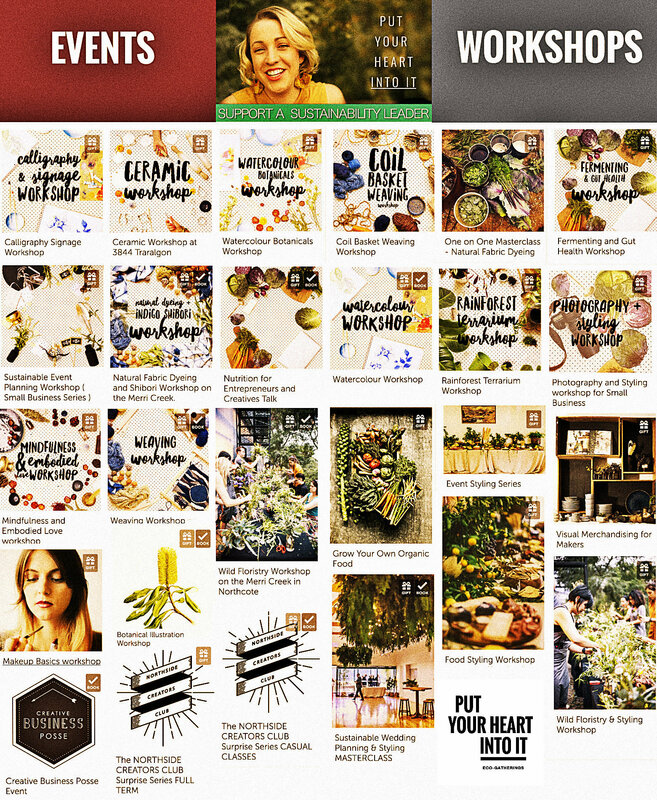 The feeling of taking home something you created, using natural products is a feeling like no other. I almost felt like an eco warrior, and that's gotta be a good thing. Why? 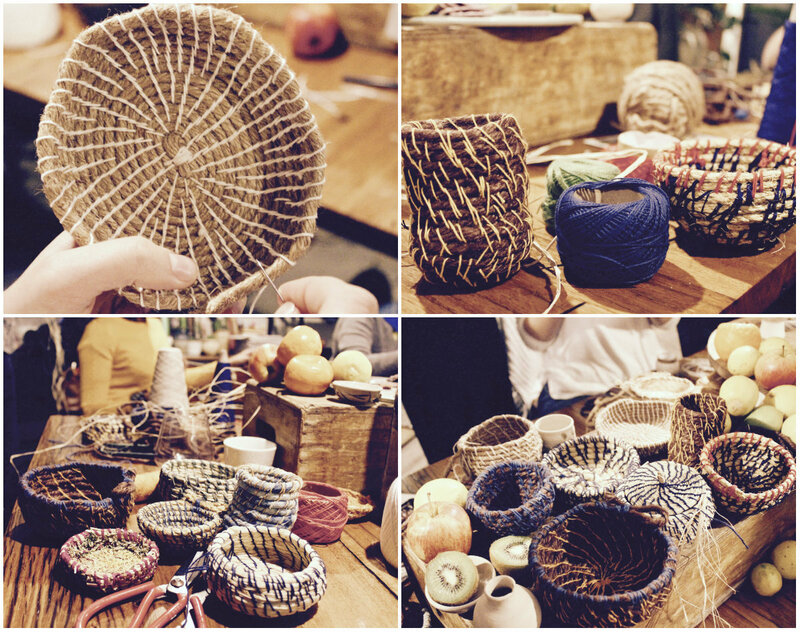 This is a review of the coil basket weaving workshop. See website for all workshops. When: This is a review only. See website for all workshops.